Modern healthcare brings great benefits, but faces many challenges. If improving patient outcomes is the goal, determining which workflows merit particular attention must be a priority. 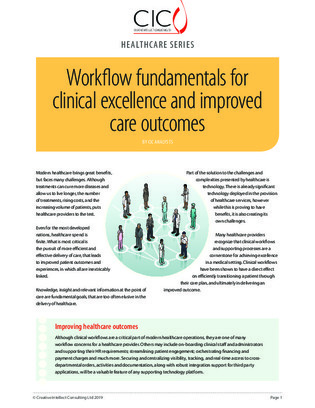 Today, workflows are a cornerstone for delivering medical excellence and improved patient outcomes. Download this white paper to find out why clinical workflows that support the capture and seamless transition of clinical and business data are paramount.